Walter George Wilkins was born in Comberton, Cambridgeshire in 18912, the only surviving child of William Robert (b. 1870, Cambridge) and Jane, his wife (b. c1865). By 1901, William Robert was working as a farm labourer in Tollerton, Notts and living there with his wife and the 8-year-old Walter George3. By 1911, they had moved to Wollaton, Notts where William Robert continued as an agricultural labourer and Walter had found work on the Wollaton Estate as a bricklayer's labourer4. At some time between then and the end of the war in 1918, the family moved to live at 22 Denison Street, Beeston5. As Walter's Army Service Record has not survived, we do not have a precise record of when he enlisted, but it was probably in February 19166 with Sherwood Foresters. After initial training, he joined the 2/7th Battalion which had returned from Ireland in January 1917. In 1916 it had been sent to Dublin to help quell the Easter Rising. It is likely that Private Wilkins was with the regiment when it left for France in February 1917 and soon took part in the pursuit of the German retreat to the Hindenbug Line7. Then on the last day of July, the three-month long series of bitter battles which made up the Third Battle of Ypres - also known as Passchendaele - with 2/7th battalion taking a full part in both the Battle of Menin Road and the Battle of Polygon Wood towards the end of September. In the Polygon Wood attack on the 26th September, the battalion was positioned west of Sciler Galleries ready to move off. At 5.50am the 2/7th were detailed to take the ground as far east as Fokker Farm. The attack went entirely according to plan and all objectives were taken within the planned timetable. A later German counter-attack caused problems but the positions were held. On that day, and the days following there were heavy casualties totaling 7 officers and 238 other ranks injured. One officer and 36 men were killed and 48 were missing. It appears that Private Wilkins was amongst those recorded as missing on the 26th8. As Private Wilkin's body was never identified he is commemorated on the Tyne Cot Memorial to the Missing within the Commonwealth War Graves Cemetery of that name. The cemetery grounds were assigned to the United Kingdom in perpetuity by King Albert I of Belgium in recognition of the sacrifices made by the British Empire in the defence and liberation of Belgium during the war. On the forward slope of the Passchendaele Ridge is the largest cemetery for Commonwealth forces in the world, for any war. The cemetery and its surrounding memorial are located outside of Passchendaele, near Zonnebeke in Belgium. The Cross of Sacrifice is to be found in a central position in the cemetery, at the base of the cross a small patch of the original German Block House can still be seen, contained within a bronze wreath, while on the far side, between it and the memorial wall, is a collection of some 300 graves. These are the original battle-field burials left where they were found after the Armistice. The other some nearly 12,000 graves which stand in parade ground order, were brought in from the surrounding area after the Armistice. The stone wall surrounding the cemetery makes up the Tyne Cot Memorial to the Missing. On completion of the Menin Gate memorial to the missing in Ypres, it was discovered that it was too small to contain all the names that were originally planned. 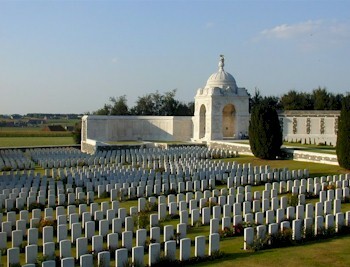 An arbitrary cut-off point of 15th August was chosen and the names of the UK missing after this date were inscribed on the Tyne Cot Memorial instead. The memorial contains the names of 33,783 soldiers of the UK forces and a further 1,176 New Zealanders.9. Private Wilkin was posthumously awarded the British War Medal and the Victory Medal10. His financial effects, amounting to £2 10 9d were paid to his father on 21 January 1918 and he was also paid his War Gratuity of £7 on 11 November 191911. Walter's parents continued to live in Beeston for much of the remainder of their lives and William's mother, Mary Poulter lived with them for some of this time12. Jane died there in 1944, aged 78. William appears to have died in the Mansfield area in 1950, aged 79. 2His birth was registered in Chesterton Registration District (of which Comberton was part) in Q3/1892 (Ref 3b 469). 3Tollerton, Notts, 1901 Census, Piece 3203 Folio 120). 4Wollaton, Notts, 1911 Census, Piece 20434 RD429 SD3 ED9 Sched 99. 5This address is recorded in the documentation connected with George's CWGC record. 6The probable date of Walter's enlistment has been calculated from the amount of his War Gratuity. 7Details of the battalion's deployment are based on the Robin Hoods website (www.therobinhoods.org.uk/orbat2.shtml) 8This account of the battalion's involvement in the Battle of Polygon Wood is derived from its war diary with some detail added from the diary of 2/8th Battalion, which was in support. 10Details from Walter's Medal Card and Medal Roll - available on ancestry.com. 12William and Jane are recorded at 11 Denison Street in the Electoral Rolls of 1921 and 1930 (when Mary Poulter is also present. William & Jane were still there at the time of the 1939 Registration.